Facing the legal system can be intimidating. You need a dedicated and compassionate advocate to navigate you through the divorce process. Whether this is your first time retaining a lawyer, or you have been down this road before, Elisa Maloff Reiter can help you. We recognize that you may not come to us at your best. Marital dissolutions are often the outcome of months and years of personal stress. You worry not only about what is ahead for you, but also the futures your children face. By managing a small law office, Elisa can provide the personalized attention you need at reasonable cost. Since she opened her Dallas-based firm in 1990, she has maintained a commitment to close working relationships with all of her clients involved in divorces that include custody, support and relocation. She is well versed in handling property cases as well - big estates or small. For you and your children, she will focus on the best possible outcome. 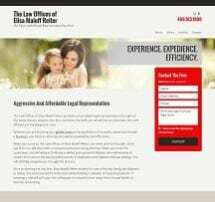 Elisa Maloff Reiter is a successful trial lawyer who is Board Certified in Family Law by the Texas Board of Legal Specialization (one of 7,000 out of 70,000 lawyers in Texas granted this distinction). She is also a certified mediator and collaborative lawyer. By tailoring her representation, she can personalize strategies based on your specific issues. Whether she is in a courtroom or behind a mediation table, she will provide you with tenacious and tough representation. Over the past 30 years, Elisa Maloff Reiter has opposed some of the best attorneys at boutique firms throughout The Metroplex. She attends to every detail in building fact-based cases. Elisa also enjoys a network of outside professionals, including experts in forensic accounting, private investigation, psychology, estate planning, intellectual property and taxes.